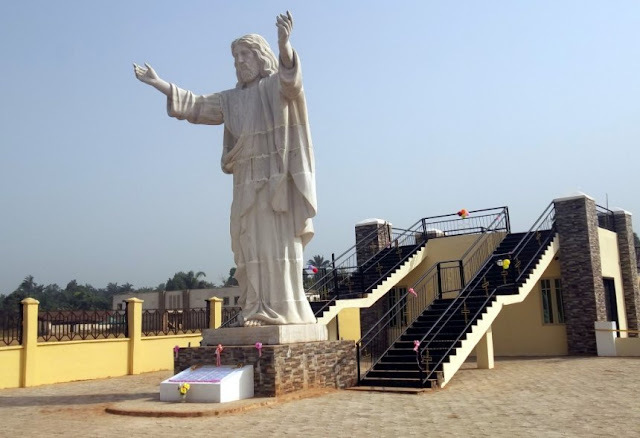 The Bishop of Orlu Catholic Diocese, Augustine Ukwuoma, on Friday unveiled the African tallest statue of Jesus Christ weighing 8.5 metres (28 ft) at St. Aloysius Catholic Parish, Abajah, Imo. The statue, made of marble, is bigger than the 20 metres (66 foot) Ramesses ii Abusimbel statue in Egypt. Mr. Ukwuoma performed the ceremony shortly after a mass attended by the Bishop Emeritus of Orlu Diocese, Gregory Ochiagha, and more than 100 priests at St. Aloysius Parish Abajah compound on Friday. One Obinna Onuoha, who donated the Jesus statue, had constructed 2, 000 seating capacity parish church at St. Aloysius in the year 2012. The unveiling of the statue was used to mark the wedding golden jubilee ceremony of the parents of Mr. Obinna, Geoffrey, and Lolo Justina Onuoha. Mr. Ukwuoma, who described the statue as magnificent, commended the Mr. Onuoha family for the gift and their benevolence to the church. “This statue is a great symbol of Christian faith, and I pray that for the Catholics that the statue will continue to constantly remind us of what Jesus Christ stands for us. “For other passersby, looking at the statue will also bring them closer to Jesus,’’ the Bishop said. Speaking on the golden jubilee, the cleric used the medium to remind marital couples on the need to see marriage as a vocation through which they could positively impact on the society. “God did not call any of us clergy and religious to be fathers and mothers, but those called into this vocation must use it to reflect God’s peace, love and unity. Mr. Onuoha, the Managing Director of Premier Petroleum Ltd., and the donor of the statue, said he constructed the statue to fulfill a vow he made to God in the year 1997. “Asking why I constructed this statue is like asking how do I came to this world, I am a Christian and a Catholic and Jesus statue represents my faith. “I believe we are here on earth for different purposes and each person moves with his/her instincts, and I was motivated to do this to build up the faith of this community,’’ he said.